ZOMG IT TRACEY DA HEGEHG!!!!111ONE!. DIS IS MY NU CHARTER SHE IZ TRACEY ND SHE GOFF. SHADDO LUF HER SEW MUCH THEY HAV SECKS EVRY DAY!!111!!one!111. Wallpaper and background images in the Girl sonic fan characters club tagged: funny stupid recolour joke. This took about 2 minutes. No, I detest recolouring. I'm just doing this to stop people recolouring and I like to see the reaction! I made a forum post saying "I SWEAR ON THE BIBLE" and you STILL don't believe me... If I DO like recolours then I go to Hell. Yeah. Can't be arsed to shade anyway. if u hate recoloring... then y did u just recolored something??? ?-? i love the dark color's and.....you spelled "death" wrong,but other than that awsome recolor!!! Arlene:I know I hate to say nasty things to people but. YOUR VERY UGLY AND IF YOU REALLY THINK SHADOW WOULD EVER LOVE YOU THEN YOUR WRONG!!! AND DON'T GET ME STARTED ON HIM SECKING YOU EVERY NIGHT, YOUR TOO UGLY!! Have a nice day! 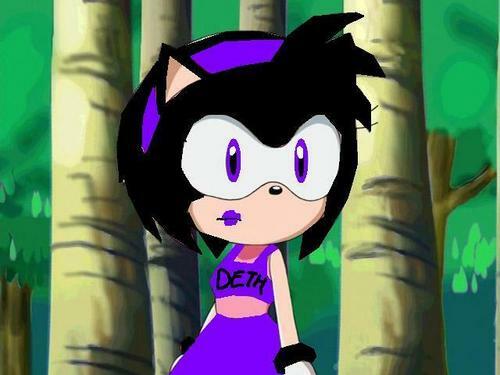 GravityForce:Wow..never knew folks could be this ugly..
That is a recolour of Amy Rose, and she belongs to SEGA so don't give credit to yourself when its a recolour!!! !